Mainstream economists like Paul Krugman have an administrative view of an economy, as though it can be managed centrally. All that matters in this viewpoint is the number of "jobs" that are created, and to Krugman and others like him, a hundred jobs "created" by government borrowing would be equivalent (and probably superior) to jobs created by a profitable business firm. A big report in The Times last Sunday laid out the facts. Although Apple is now America’s biggest U.S. corporation as measured by market value, it employs only 43,000 people in the United States, a tenth as many as General Motors employed when it was the largest American firm. In other words, in Krugman's view, Apple has no usefulness as a firm beyond how many people it employs. Its economic contribution stops at that point. Firms do not exist to employ people; people are employed in the process of creating goods that are useful to others, and if one were to gain a sense of the real economic contribution of Apple, it would be safe to say that the company has created hundreds of billions of dollars of wealth, and Apple products and the technologies they have spun off have impacted the lives of billions of people. That's right, billions. The point is that successful companies — or, at any rate, companies that make a large contribution to a nation’s economy — don’t exist in isolation. Prosperity depends on the synergy between companies, on the cluster, not the individual entrepreneur. ut the current Republican worldview has no room for such considerations. From the G.O.P.’s perspective, it’s all about the heroic entrepreneur, the John Galt, I mean Steve Jobs-type “job creator” who showers benefits on the rest of us and who must, of course, be rewarded with tax rates lower than those paid by many middle-class workers. In other words, entrepreneurs don't matter in the Krugman view of an economy. Of course, he forgets that one of this country's most important places of synergy, Silicon Valley, came about because of the vision of a few entrepreneurs who turned their ideas into the creation of huge amounts of wealth. Furthermore, he seems to forget that most of the great entrepreneurs of recent times have been...Democrats. From Steven Jobs to Bill Gates to Michael Milken to the founders of Google, liberal Democrats have made a huge economic impact because they had great ideas and how to put them together to create new products. ...this vision helps explain why Republicans were so furiously opposed to the single most successful policy initiative of recent years: the auto industry bailout. The case for this bailout — which Mr. Daniels has denounced as “crony capitalism” — rested crucially on the notion that the survival of any one firm in the industry depended on the survival of the broader industry “ecology” created by the cluster of producers and suppliers in America’s industrial heartland. If G.M. and Chrysler had been allowed to go under, they would probably have taken much of the supply chain with them — and Ford would have gone the same way. Fortunately, the Obama administration didn’t let that happen, and the unemployment rate in Michigan, which hit 14.1 percent as the bailout was going into effect, is now down to a still-terrible-but-much-better 9.3 percent. And the details aside, much of Mr. Obama’s State of the Union address can be read as an attempt to apply the lessons of that success more broadly. First, Krugman assumes that there are no other auto producers in this country, and I am sure that many of the assets of Chrysler and GM would have been put to good use. Second, Krugman forgets that the bailout did not occur in order to save "clusters," but rather to force taxpayers to pony up to save the United Auto Workers. The reason that GM and Chrysler were bankrupt was that they were producing goods that consumers were not willing to purchase, and neither company was willing to do what was necessary to turn around the situation. Yes, they had intransigent unions and delusional managers, but that did not mean that the rest of us should have been forced to cover for them. Chrysler and GM were destroying wealth, not creating it, and by rewarding their actions, the Obama administration sent a strong message that the only thing that matters in this economy is a political connection. Krugman has no idea how markets work and he certainly does not understand a price system. (Sorry, aggregate supply and aggregate demand models have nothing to do with price systems or even economics.) Once again, we see that he really does not know what wealth creation means and cannot differentiate between a job that creates wealth and a job that destroys it. I have said many times that Paul Krugman is much more a political operative than an economist, and while that makes people mad, it also is true. And the day before President Obama's State of the Union Speech, suddenly the gloomy, "We-Are-Practicing-Austerity" Krugman was singing the praises of Obama the Great. Yes, this is the same Obama that recently Krugman was claiming was not spending enough and was going to throw us into another downturn because of his policies of "austerity." But now that we are in a political campaign, Krugman is singing, "Happy Days are Here Again." He claims that he was abused when he pointed out the housing bubble, and I find it interesting that in his blog posts and elsewhere, he has attacked Peter Schiff, yet it was Schiff who was the most vocal about the bubble and its meaning. Furthermore, Mark Thornton in 2004 had made the point about the bubble, and Ron Paul was playing Paul Revere on the subject in 2003. However, since Krugman thinks Austrians are idiots and don't know any economics, he throws the Austrian warnings down the Orwellian Memory Hole. But the economy is depressed, in large part, because of the housing bust, which immediately suggests the possibility of a virtuous circle: an improving economy leads to a surge in home purchases, which leads to more construction, which strengthens the economy further, and so on. And if you squint hard at recent data, it looks as if something like that may be starting: home sales are up, unemployment claims are down, and builders’ confidence is rising. Furthermore, the chances for a virtuous circle have been rising, because we’ve made significant progress on the debt front. That’s not what you hear in public debate, of course, where all the focus is on rising government debt. But anyone who has looked seriously at how we got into this slump knows that private debt, especially household debt, was the real culprit: it was the explosion of household debt during the Bush years that set the stage for the crisis. And the good news is that this private debt has declined in dollar terms, and declined substantially as a percentage of G.D.P., since the end of 2008. Krugman is talking apples and oranges. No one has claimed that government debt brought about the recession; instead, they are saying that adding trillions of dollars of government debt only exacerbates the problem. Moreover, he is saying that housing has bottomed and maybe things will get better. Why didn't housing bottom sooner? It did not bottom because Krugman and others argued that the government should continue to pump huge amounts of money into those failing sectors in order to prop them up, as though higher prices bring prosperity. So, the government did just that and housing fell, albeit more slowly, but it fell, so the pain was stretched out. So, in order to avoid a worse recession, the government created a depression. But now that Obama is up for re-election, suddenly he is Mr. Job Creator. Yes, the man who has pumped hundreds of billions of dollars into "green energy" and other such boondoggles suddenly is responsible for bringing back prosperity. Somehow, I doubt that is happening, but political operatives are not exactly known for their truth telling. As for Krugman's claim that more inflation and more government debt will give us recovery, Frank Shostak, who is a much better economic analyst than Krugman, says that recovery will come only when the government ends its jihad against savings. No, Shostak doesn't have a Nobel, but he does actually understand economics. [Update]: In his column today, Krugman continues the theme that capital gains taxes should be higher, although he does not say HOW high. His reference toward Ronald Reagan invokes another logical fallacy, as though whatever Reagan did regarding taxes always should be acceptable to people who hold to free-market principles. Here’s how Romney’s low taxes will be defended by smarter conservatives (the less smart ones will just shout “class warfare”): they’ll claim that there are compelling reasons to have low taxes on capital gains, and that there is therefore nothing wrong with having very high-income people paying lower tax rates than the middle class. Like Barack Obama, he is slippery with his language, for even with lower rates, people who gain most of their income via investment are going to pay significantly higher amounts in taxes than others. Unfortunately, in a speech the other day, Obama first mentioned tax rates and then he claimed that the wealthy thus pay "lower taxes" than do people in the middle class. That simply is false, but a president who claims that paying unemployment benefits will "create more jobs" than the construction of an oil pipeline (and, by insinuation, more wealth) simply is delusional about the economy. Keynesianism will do that to people. The U.S. economy did well relative to the rest of the world (which was recovering from World War II) at this time, so does Krugman also believe, in the name of "fairness," that the capital gains rates also should have been 91 percent? I don't know, but I don't see, using his own logic, how he can argue against that modest proposal. In fact, during that time, even some of the LOWEST rates were higher than 25 percent or slightly under 25 percent. Thus, will Krugman and Obama complain that the capital gains rates in the 1950s were unjust because they were lower than tax rates that people earning small incomes were paying? I don't know, although it seems that Krugman seems to be fixated on the current situation while claiming that the 1950s were prosperous years, and I suspect he believes that the high tax rates were part of the reason for the prosperity. If Paul Krugman believes that capital gains taxes always should be at the top rate, since it would be unfair for investors to pay the same rates (or less) than the middle class, perhaps we need to look at the various marginal rates of income taxation to see if Krugman is trying to pull a fast one. For example, during the time in the 1950s when capital gains rates were 25 percent, the top income tax rate in the USA was 91 percent. 14 12% 50% $106,000 $199k "
5 11% 38.5% $90,000 $178k "
2 15% 28% $29,750 $56k "
In the end, I don't think Krugman is making much of an argument. For example, as one who was in college in the early 1970s and then being in the workplace for more than half the decade, the 40 percent capital gains rates also coincided with an era of high inflation and high unemployment. If Krugman believes that capital gains rates should reflect normal income tax rates, then he is saying that we need 40 percent capital gains rates again. For that matter, the 1970s were a time of economic stagnation, not unbridled prosperity, as Krugman wants us to believe. He might hate the 1980s, but that also was a time of huge private investments in the high-tech sector and telecommunications, and Daniel Henninger of the Wall Street Journal has an excellent column about that era, including the corporate raiders that Krugman claims did so much damage. The article deals with the actual state of business entrepreneurship at that time, something that Krugman is incapable of understanding, since all of his economic analysis is done with the crude aggregates of the Keynesian models, and there is no way to fit entrepreneurship into those contraptions. There is a larger issue, however, and that is private investment as a whole. Krugman, being a good Keynesian, holds that economically speaking, government "investment" is just as good as private investment, so it doesn't matter if the government is building nuclear weapons or a farmer is growing crops. If the GDP numbers of both are equal, then both are equal in their wealth component. Is this a ridiculous example, since even Krugman would admit we cannot eat nuclear weapons? In one way, yes, but in the Keynesian structure, it is not ridiculous. And given that Krugman has given us his "confidence fairy" ditty numerous times, it is clear that he does not hold private investment to be anything but another form of spending, and if government can spend in equal amounts, then it is just as well and perhaps better, since in Wonderland, State Power equals freedom and prosperity. These are mutually-exclusive beliefs, but nonetheless he expresses them both, but if there is to be a choice, it always is in favor of more state power. Given that Krugman and President Obama have called for a return to the 39.6 percent upper-income tax brackets (and Krugman on many occasions has intimated that it should be even higher), one can assume that Krugman also wants a near-40 percent levy on investment income. Now, given that his Keynesian beliefs permit him to assume that the Law of Opportunity Cost does not exist when government is involved, we safely can assume that Krugman believes that if investment income were taxed at about 40 percent, then there would be exactly the same amount of overall investment income that would be taxed. In other words, a 40-percent tax rate would not discourage investors from putting even a penny less of investment, and that investment returns would not change. My sense is that Krugman believes that even if private investment were to fall, government could make up the difference with investing. Of course, everyone knows that government investments are made in "wise" things like "high-speed rail" in California (a true boondoggle if ever there was one), Solyndra, corn-based ethanol, electric windmills, auto industry bailouts in order to prop up the United Auto Workers, and so on. By moving resources from higher-valued uses to lower-valued uses, government works is "magic," making us poorer, but apparently that is what Krugman believes is morally and economically preferable to anything that might advance private investment. Furthermore, Krugman deftly changes "tax rates" to "taxes" themselves, which is what Obama also has been doing. No, Warren Buffet does not pay less in taxes than his secretary, and Mitt Romney does not pay less in taxes than do I. For that matter, I am sure that Krugman himself pays more taxes than do most of us. 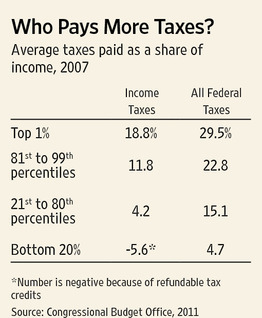 But there is a difference in tax rates and taxes, even if Krugman wants to confuse us on that subject. The more I read of Krugman, the more I realize that he is just a pure statist. The corporatism that he espouses (government funnels money to politically-connected firms, with the financial markets essentially carrying out state-sponsored directives) has been seen before, whether in Mussolini's Italy, Hitler's Germany, and Peron's Argentina. We know how those regimes went down, and ours will fare no better, and in the end, Krugman will blame private enterprise and call for even more statism. Do savings really cause depressions? One of the constant themes in Keynesian (and Krugmanian) economics is the evil of savings, and how government must manipulate the currency and the banking system in order to discourage people from saving money. On a number of occasions in his columns and blog posts, Krugman has invoked the hoary "paradox of thrift" which uses the Fallacy of Composition to declare that while it might be OK for a few individuals to save a few bucks here and there, it is disastrous if everyone saves at once. This example "proves" that if people save money, then GDP must fall. When people save money, Keynesians argue, not all of it is invested immediately, so when some current spending is eliminated but is not immediately spent as investment, there is a lull in which the economy is dragged down. Furthermore, they argue, once the economy starts to plunge, unless government immediately disrupts the pattern by spending and also inflating (which undermines savings), then aggregate demand will fall and investors will fail to create new capital, since they don't anticipate demand for the products it will help produce. The Keynesian Multiplier, along with graphs such as what Krugman trots out, are shown as "proof" of this point. The Multiplier is expressed as 1/savings rate (Marginal Propensity to Save) which also can be expressed as 1/(1 - Marginal Propensity to Consume). For example, say the MPC is 80 percent (or 0.8) and the MPS, then would be 20 percent (or 0.2). In other words, people in an economy would spend 80 percent of their income and save 20 percent. Thus, the Multiplier would equal 1/0.2 or 5. However, if people saved only one percent of their income, then the Multiplier would be 1/0.01 or 100, which "proves" that the less we save, the more prosperous we will be. An obvious questions arises: If savings is bad, why not have a zero savings rate, which then would give us a multiplier of infinity? Keynes, when faced with that same question, declared that at that point, inflation would skyrocket, although he did not explain why that would be a bad thing, given that Keynesianism is based upon the "magic" of inflation, anyway. This economic viewpoint, however, is based upon a nuanced view of capital, that it is homogeneous AND that the value of capital formation is in the spending that takes place, not with capital itself. And, Keynesians argue, because increased savings lower the value of the Multiplier, that the "solution" is for people not to save (or save as little as possible) and depend upon government or the central bank (or both) to manufacture the money needed for capital investment out of thin air. All of this crashes, however, if capital is heterogeneous. Furthermore, if capital can be malinvested -- and Austrians argue that will be the case when capital is created via inflation -- then the Keynesian scheme is destined to end in disaster. That is what we are seeing now. For more than two decades, the government has followed the pattern of inflating, running into malinvestments, inflating the economy into "recovery," and then dealing with future crashes that are larger. We have seen the Tech Bubble and collapse, the Housing Bubble and collapse, and now the governments around the world have created the Sovereign Debt Bubble which is destined to collapse. Krugman can use all of the graphs and math that he wants, but he cannot get around the sticky problem of heterogeneous capital, nor does he have an answer for malinvestments. His M.0. has been to state his case and then attack anyone who disagrees, claiming that their disagreement is based upon their fundamental desire for people to suffer and to be out of work. That is not economics, but then Keynesianism is not economics, either. There is life imitating art, art imitating life, and then there is make-believe. Not surprisingly, Paul Krugman chooses the third option, at least when it comes to his belief that Oliver Stone's "Wall Street" gave an accurate picture of how private equity firms work. In his most recent column, Krugman quotes Gordon Gekko's famous "greed is good" speech as though that actually were accurate economics -- that corporate raiders could make money by buying healthy firms and then destroying their value. What Krugman wants us to believe is that companies like Bain Capital would target successful, healthy, profitable firms, purchase them, and then make money either by running them into bankruptcy and then selling their assets. Now, perhaps at Princeton University, they teach that firm owners become wealthy by driving their firms into insolvency, but I would like to know how the market value of a company would INCREASE when it is careening into failure. Macey's point is simple; a firm like Bain Capital purchases a firm that is underperforming relative to similar companies, restructures it, and then sells it. In order to profit, the private equity firm must be able to sell the firm (or its assets) for more than it paid for the company at the beginning. Some common sense is in order, as Macey notes. A company cannot purchase a healthy company, run it into the ground, and then sell it for more than for the purchase price. While Krugman might believe that business people are utterly stupid (as opposed to professors and politicians), they are not so stupid as to buy high and sell low and do it consistently -- and remain in business. If the Bain Capitals of the world are going to make profits, then they have to sell businesses or their assets (or both) for more than what they paid for the company, and they are NOT going to be able do that by looting a company. That simply makes no sense, which is why I hardly am surprised that both Krugman and Newt Gingrich seem to share the belief that businesses can profit by buying healthy companies, destroying them, and then getting even more value from their sale. None of this means I am endorsing Mitt Romney for president. I hardly am enamored with his candidacy, but when people like Krugman and Gingrich demonstrate that they are utterly ignorant of how the leveraged buyout process works while condemning the whole practice, I'm going to speak up for the simple reason that someone needs to be able to explain some of the simple yet profound tools of economics without the political baggage. ...the fact is that running a business is nothing at all like making macro policy. The key point about macroeconomics is the pervasiveness of feedback loops due to the fact that workers are also consumers. No business sells a large fraction of its output to its own workers; even very small countries sell around two-thirds of their output to themselves, because that much is non-tradable services. This is yet another example of the fallacy of "buy back the product" in which production and consumption are regarded as two independent and unrelated things, except that unless workers can "buy back" what they have produced, then the economy will plunge into recession. In other words, what an economy produces really means nothing in terms of wealth. The production of goods is seen as an impediment to employment. Now, it is one thing when President Obama declares that capital creates unemployment; he is a politician and cannot be held responsible for saying anything of economic intelligence. However, Krugman is supposed to know better. Economists actually are supposed to understand that when capital is created within a free market system, permitting people to create more goods, that this ultimately creates new opportunities for others. So there you have it. Capital creates recessions; savings creates recessions. More brilliant economic analysis from Princeton University. Sintija now officially is an Anderson! A Latvian court today granted our adoption petition for Sintija, so she now officially is our daughter! Johanna and Sintija are in Latvia this week and will return to the USA on Thursday and come home on Friday. They will travel back to Latvia in about a month to obtain the permanent resident visa from the U.S. Embassy, and then we will go about doing the re-adoption here in Maryland. This is a wonderful day, and we are thankful to all of you who have supported us. It always is interesting to see how the "elite" media also seems to produce the most number of economic fallacies, and a trip to the New York Times, and especially its editorial page, never disappoints. In this editorial, we find that laws that force up the price of labor create wealth. I would suggest you try this at home. If you get two bids for work and you are assured that the quality of work would be the same, take the higher bid because the higher costs will create more wealth. Yeah, you will be using more resources, economically speaking, to do what could have been done with fewer resources, but who are we to argue with the brilliant minds at the NYT? Several years ago, I wrote that Paul Krugman really is not an economist, but rather is a political operative, and he has done his level best since then to prove my point. He does it again in his latest column. According to Krugman's writings on the subject of employment, he begins with jobs first, or, to be more specific, the number of jobs. To Krugman, there is no difference in jobs, economically speaking, if they are created because Apple expands its operations or if the government subsidizes a Solyndra. If Apple's expansion meant a thousand extra jobs, but the government payments to Solyndra resulted in 1,100 new (and, obviously, temporary) jobs, Krugman's logic would say that the Solyndra gig would be better for the economy, even if Apple were profitable and Solyndra was hemorrhaging cash. Americans have jobs now than when Mr. Obama took office. But the president inherited an economy in free fall, and can’t be held responsible for job losses during his first few months, before any of his own policies had time to take effect. So how much of that Obama job loss took place in, say, the first half of 2009? The answer is: more than all of it. The economy lost 3.1 million jobs between January 2009 and June 2009 and has since gained 1.2 million jobs. That’s not enough, but it’s nothing like Mr. Romney’s portrait of job destruction. Incidentally, the previous administration’s claims of job growth always started not from Inauguration Day but from August 2003, when Bush-era employment hit its low point. By that standard, Mr. Obama could say that he has created 2.5 million jobs since February 2010. Now, given that a lot of these "jobs" either have been government jobs or jobs that came through government-subsidized industries, perhaps we should be asking if the Obama administration's policies have made it easier or more difficult for businesses to create new wealth. After all, if you want to create "full employment," it is easy: just tell everyone they only can do agricultural work but cannot use any tools in the process other than your hands. I can assure you that people will be busy, at least until they starve to death, but, hey, they will be employed. Private net investment is currently running far below the rate required to sustain a rapid rate of economic growth. Real consumer spending, in contrast, peaked in the fourth quarter of 2007, fell only slightly (about 2.5 percent) to the second quarter of 2009, and by the fourth quarter of 2010 exceeded its previous quarterly peak (by almost 1 percent). Despite the wailing and gnashing of teeth among Keynesian economists and politicians with regard to allegedly inadequate consumption, a collapse of consumption is not to blame for the economy’s anemic recovery to date. However, looking elsewhere for the cause, we find that the economy’s true engine of growth – private business net investment – continues to sputter, running in the most recent quarter at less than a third of its previous peak rate and, for the entire year 2010, at only 40 percent of its rate for the entire year 2007. Investors continue to view the future with major misgivings, owing to the unsettled condition of the government’s future actions with regard to health care, financial regulations, energy regulations, taxation, and other matters that have serious implications for business costs and the security of private property rights in business capital and its returns. Although ObamaCare and the Dodd-Frank bill have already been enacted, these massive statutes leave scores of important details awaiting determination by administrative agencies and courts whose actions will be fiercely contested at every step. Future tax rates also remain up for grabs in Congress. Krugman might call it the "Confidence Fairy," but government cannot make up for lost investment and, in fact, bears huge responsibility for the current lag in private investment. At this point, some readers may ask whether it isn’t equally wrong to say that Mr. Romney destroyed jobs. Yes, it is. The real complaint about Mr. Romney and his colleagues isn’t that they destroyed jobs, but that they destroyed good jobs. When the dust settled after the companies that Bain restructured were downsized — or, as happened all too often, went bankrupt — total U.S. employment was probably about the same as it would have been in any case. But the jobs that were lost paid more and had better benefits than the jobs that replaced them. Mr. Romney and those like him didn’t destroy jobs, but they did enrich themselves while helping to destroy the American middle class. Paul Krugman demonstrates his utter ignorance at what happens in business restructuring and leveraged buyouts. When a firm like Bain purchases a firm and then sells its assets and makes money in the process, the Krugmans in the academic and political world scream that Bain is DESTROYING JOBS. However, let us think about this and ask the obvious question: How can Bain do this in the first place? It can do it because when a business is successful, the whole is greater than the sum of its parts. However, a failing business is going to find itself in the opposition situation: the sum of the parts is greater than the whole. For example, would any capital firm try to purchase Apple today and then make money selling off the company's assets? Hardly, as the strength of the company is entrepreneurship, and that is not a commodity that can be bought and sold. Unfortunately, Krugman wants us to believe that Bain and other corporate raiders took perfectly healthy firms and then destroyed them, and that the markets were so twisted and so incapable of seeing that good firms unjustifiably were being taken apart that they stupidly purchased the assets for more than the raiders paid for the entire company. Krugman never explains how this is possible, but perhaps it is because he simply cannot comprehend the simple aspects of Opportunity Cost. Whatever the reason, he clearly does not even begin to understand how markets work, not to mention the role of the price system. You see, Krugman actually believes that markets DESTROY wealth, but governments create it through vast networks of subsidies and regulations. He never has explained how and why this is so, but perhaps he believes that since he is Paul Krugman, he doesn't have to explain anything. ENTREPRENEURS? We don' need no stinkin' entrepreneurs! Paul Krugman wants us to believe that he first looks at the situation, and then tries to determine what theory would apply to it (or make up a new theory). He, dear reader, never comes into a situation with preconceived notions, unlike someone like, say, Tyler Cowen. Yes, this someone who believes that a babysitting co-op in Washington provides the appropriate "model" for an entire complex economy. The co-op printed more coupons (money) and that allegedly fixed everything (although it didn't), so if the Fed prints more "coupons," then our economy will recover. Yes, the perfect model. Krugman condemns in others what he does himself. Krugman: Government debt is no burden because "we owe it to ourselves"
In his latest missive, "Nobody Understands Debt," Paul Krugman proves that he does not know debt, or at least government debt, either. While there is much to dislike in the column, I am going to deal with his claim that government debt is different because it is "money we owe to ourselves." Krugman's reasoning, however, can apply to private debt as well, since he decides to use collective terms. In the case of private debt, individuals borrow from banks or other individuals, and bank loans are created by individual deposits. Therefore, when individuals don't pay back their debt, someone has to take a haircut. Government loan guarantees tend to cloud this picture, but even when a guaranteed loan falls into default, individuals -- taxpayers and consumers -- are forced to give up some of their real income either through taxation or inflation. There really is not a free lunch, even if Krugman wants to claim there is. Most Americans borrow from other Americans, so using the standards for public debt that Krugman has given, it would seem that most private lending also involves money "we owe to ourselves." One is not free to apply a collective term to government and then claim that it is not applicable to private activity, given there is nothing magical about government that can create a "collective" by fiat. The ingenious slogan that the public debt does not matter because “we owe it to ourselves” is clearly absurd. The crucial question is: Who is the “we” and who are the “ourselves”? Analysis of the world must be individualistic and not holistic. Certain people owe money to certain other people, and it is precisely this fact that makes the borrowing as well as the taxing process important. For we might just as well say that taxes are unimportant for the same reason. Now, the fact that federal debt isn’t at all like a mortgage on America’s future doesn’t mean that the debt is harmless. Taxes must be levied to pay the interest, and you don’t have to be a right-wing ideologue to concede that taxes impose some cost on the economy, if nothing else by causing a diversion of resources away from productive activities into tax avoidance and evasion. But these costs are a lot less dramatic than the analogy with an overindebted family might suggest. And that’s why nations with stable, responsible governments — that is, governments that are willing to impose modestly higher taxes when the situation warrants it — have historically been able to live with much higher levels of debt than today’s conventional wisdom would lead you to believe. Britain, in particular, has had debt exceeding 100 percent of G.D.P. for 81 of the last 170 years. When Keynes was writing about the need to spend your way out of a depression, Britain was deeper in debt than any advanced nation today, with the exception of Japan. In the Keynesian world, there is no opportunity cost. As Keynes wrote in 1943, credit expansion by the central bank performs the "miracle" of "turning stones into bread." Because Keynesians believe that a market economy is destined to implode because individuals save some of their income, not spending all of it instantly, it is up to government, to paraphrase Krugman, to "fill the hole" left by the loss of private spending. The public debt transaction, then, is very different from private debt. Instead of a low-time preference creditor exchanging money for an IOU from a high-time preference debtor, the government now receives money from creditors, both parties realizing that the money will be paid back not out of the pockets or the hides of the politicians and bureaucrats, but out of the looted wallets and purses of the hapless taxpayers, the subjects of the state. The government gets the money by tax-coercion; and the public creditors, far from being innocents, know full well that their proceeds will come out of that selfsame coercion. In short, public creditors are willing to hand over money to the government now in order to receive a share of tax loot in the future. This is the opposite of a free market, or a genuinely voluntary transaction. Both parties are immorally contracting to participate in the violation of the property rights of citizens in the future. Both parties, therefore, are making agreements about other people's property, and both deserve the back of our hand. The public credit transaction is not a genuine contract that need be considered sacrosanct, any more than robbers parceling out their shares of loot in advance should be treated as some sort of sanctified contract. Any melding of public debt into a private transaction must rest on the common but absurd notion that taxation is really "voluntary," and that whenever the government does anything, "we" are willingly doing it. This convenient myth was wittily and trenchantly disposed of by the great economist Joseph Schumpeter: "The theory which construes taxes on the analogy of club dues or of the purchases of, say, a doctor only proves how far removed this part of the social sciences is from scientific habits of mind." Rothbard was writing in favor of repudiation of government debt (which then would discourage individuals from lending to the government in the future), but the larger point still stands. All taxpayers are on the hook for repaying government debt, but the terms are decided by others. It is the ultimate "loan guarantee" in which people who don't participate in the process still are forced to pay for it. Krugman calls it a "social contract." I think it should be called something else.